I had a three day weekend and therefore took advantage of the unseasonably warm (mid-50's) and sunny skies to visit a fire tower lookout in the north Poconos of Pennsylvania. The drive was about 65 miles and took about 2 hrs the first time. It was a beautiful day and I arrived about 3 pm. The access road was gated so I parked and set off with my daypack of my the K1 and my multiband dipole, extra windproof clothes, etc. It was a beautiful fall afternoon for the hike into the tower site. 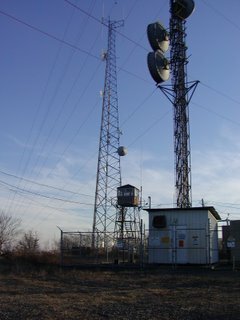 I could see that there were some commercial communication systems also at the site as evidenced by the at least 3 tall towers. I arrived about 35 mins later and the view was good in nearly 360-degrees but there were a number of commercial installations and there gated towers and service buildings. The fire tower itself was small incomparison at only about 25' tall. I set up on the grass next to a fenced area, threw a rock and line through one of the tower legs, pulled one end of the dipole up and, using the same rock and line over a telephone pole line for the other end. In all, I estimate the dipole at 20' to 25' above ground. I had much more coax then I needed. I set up the K1, batteries, pulled on the extra windpants and sat down to call CQ. Where's my logbook? Oh, great! I left it home! The best I could do was write on the back of a 3 x 5 card! On my first CQ I got a W8 from Illinois but now my pen won't write because it's too cold! The ink won't flow! Great! 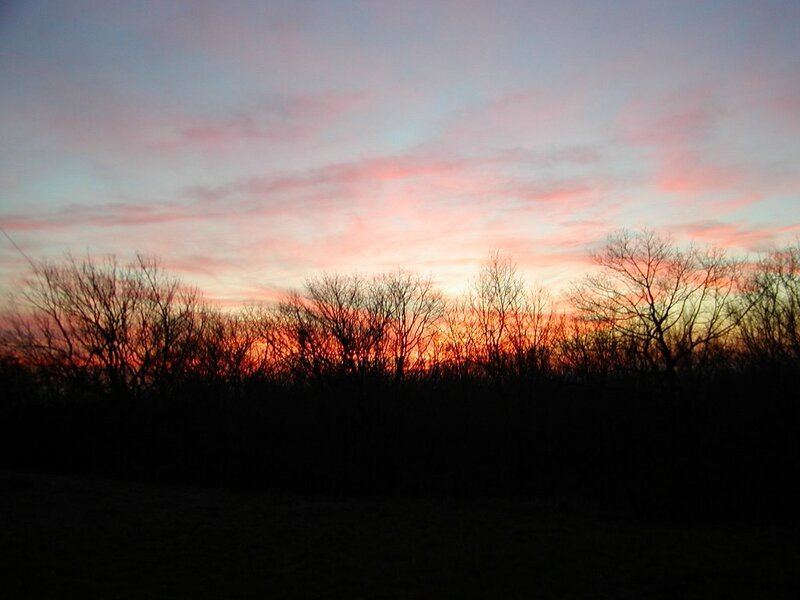 The temp was now into the 30's as the sun was setting. The sunset was beautiful and very colorful but I learned that I need to bring a pencil because ink doesn 't flow at near freezing temps! Oh well....experience is a powerful teacher. Now I was copying in my head and trying to remember calls and names....so far so good. Time out to stretch, warm up a bit, try to get my hands warm again. The polypro gloves are not adequate to be effective especially if there is any wind blowing. My fingers were really cold and that was impacting my cw keying abilities. I need to find some additional gloves that won't impact my keying requirements. The sunset was great and I stayed until about a half-hour after it set. The temp was plummeting and the wind still at 15 mph or so but really getting to my cold hands. Although I was looking forward to a night hike out, I decided to pack up early and walk out when there was still some light. A half-hour later I was on the road out and back to the pickup where the temp was reading about 28-degrees. No wonder I was cold. It was probably 25 or so on the top! Anyway it was a beautiful afternoon and another fun area to scout and consider as a future operating site or campover site. This was the initial message from Ron Polityka announcing a Polar Bear "outing" on Sunday, Nov. 13th. 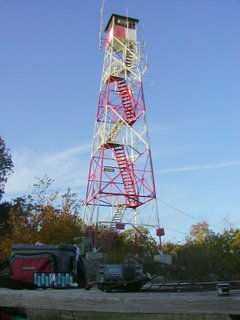 I went up to the BearFort Fire Tower which is about 10 mins from my house but is on the BearFort Mtns, actually a ridge, that runs north and south in north New Jersey. It has a great overlook west and east and is about 400' or so HAAT. So the RF takeoff angles are great. It was warm with temps in the mid-50s but a 15 -20 mph south wind will keep it chilly as nightfall approaches. It was clouding up since a weather front was approaching from the west with expected rain after midnight. It's about a 15 min hike up the fire access road to the fire tower. It was really pretty since about 80% of the leaves have fallen but some leaves on the more hardy trees were still hanging on. The road itself was completely leaf covered. Surprisingly the Fire Tower was manned as there was motorcycle at its base. This was a first for me and kind of surprising for this late in the year. I climbed the tower stairs and connected my dipole rope thru a pulley that I left in place from my last visit. The other dipole end is strung through a tree about 150' away...this is a nice setup which results in my multiband dipole having an average heigth of about 35' or so. Excellent! Sunset was at 5pm and I took about 45 mins to get everything installed. It was starting to get cooler and the wind was steady out of the south. The almost full moon was rising behind the thin overcast in the east. I got on the air on 40m but was inundated with eu RTTY contesters....they occupied frequencies down to 7020. I made a couple of QSO's but was fighting the RTTY guys. No fun. So I lowered the dipole and switched over to 30m. My first with this antenna and at this site. Boy did it work great! I had a number of good QSO's and everyone was surprised at my QRP signal strengths. I was getting colder....I really needed another layer of windbreakers, especially for my legs. I had my gloves on and sending CW was a bit of challenge. It was real dark now; the overcast clouds were blocking most of the full moon light. My "red" LED headlight was doing a great job...no excessive "white" lights to night blind me. I was getting cold and made some mental notes to bring more layers on my next polar bear outing. The wind chill was the challenge and my hands were cold in spite of some poly gloves I had on. I know I would have been warmer if I had a windbreaker layer on top of what I was wearing. The problem is that you are stationary and not moving when operating and consequently getting cold. The highlight of the evening was a call by a previous contact from the same site, CU2JT, Gary, who heard me calling CQ and answered. We had a good QSO for nearly 45 mins or so. It was now about 6:45pm, cloudy, dark, and cold with temps around 45-deg f. The wind was still at 15-20 mph from the south. I was cold so I packed up and hiked out. To disassemble takes about 30 mins total. Not bad at all. I have been corresponding with Ed Breneiser, WA3WSJ, via email for several weeks concerning "scenic vistas on the AT in PA." Ed indicated that one of their local spots, Pulpit Rock, was "just about as good as it gets for the AT in PA." That was good enough for me so I took a vacation day from work, got up at 4 am on Friday the 4th of Nov. and drove the 120 miles to Hamburg, PA. We met at 8 am and drove out to the parking area and began our hike into the site. The fall colors were spectacular, the temps in the mid 50's, sunny and windless. It doesn't get much better than this. The 2.5 mile hike in was painless due to the non-stop conversation and the breathtaking weather and scenic fall colors. The site at the top is part of the LeHigh Valley Astronomy club and consists of a cleared mountain top area for their 4 observatories. The "Rock" itself is a overlook of the Reading valley area. Very scenic and the views south were great. I set my 20m vertical up in a grassy area near one of the observatories. Ed was nearby on 40m. We made a number of contacts, my best into Europe (Budapest Hungary). After an hour of operating in the HOT sun, we packed up and walked back to the vehicles. Temps were now in the low 70's. Outstanding for this time of the year. We drove over for lunch at Cabela's who claim to be the "world's largest outfitters". Their PA store is HUGE and an outdoor enthusiasts dream world! Lunch was great and filling. We were then off for the 30 min drive to Round Rock, our overnight destination and a 3.5 mile hike in over "typically rocky" AT trail terrain. We were with full packs now: mine at an overweight, carry everything-you-might-ever-need 45# and Ed's a more seasoned veterans weight of 30-35#. After a mile or so, the rock "scramble" began over challengingly difficult, very rocky and very leaf-covered trail terrain. The heavy leaf cover made travel slow because you were never sure of your footing! 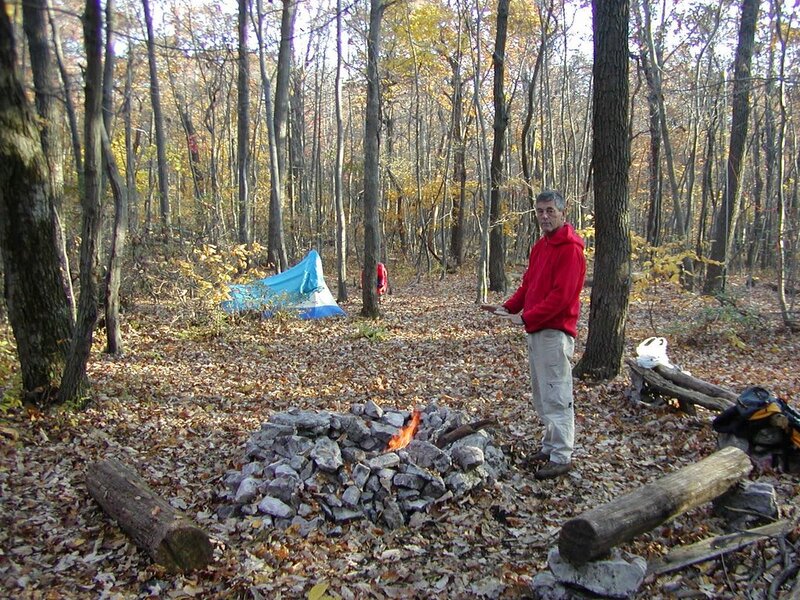 We got to the ridge campsite about an hour before sunset (5pm EST), quickly put up antennas and tents. I tried 30m for the first time with my vertical. I was not pleased. I need to check continuity of my elements. I should have brought my new, multi-band dipole instead. Conditions were only "ok" and I had to really work for contacts. There was a firepit at the site so we made a very nice campfire. I think I enjoyed the campfire as much as the remote, field operating. The temps were still mild and there was very little wind. We both retired to our tents about 8pm. I was tired because of my long day and only operated for about an hour. The next morning I converted the vertical to 20m and was making a number of contacts with several into Europe. Always enjoyable to work EU on 5 watts! The K1 has such a great receiver! We hung around until about 11:30, then packed up and hiked out. Ed had his daughter's 30th birthday party that afternoon so we had to get him out and I had the 2-1/2 drive back to NJ. 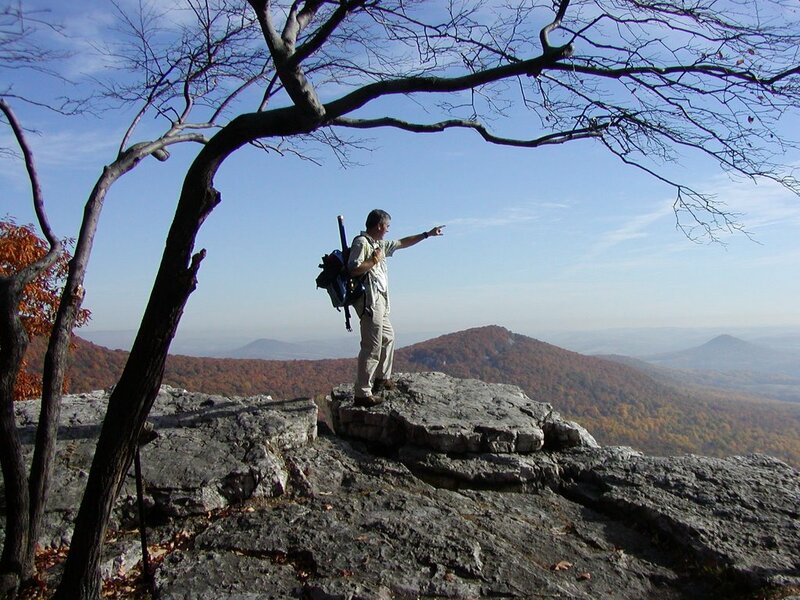 All in all it was great overnight and a pleasure to meet Ed and see some great hiking and vista areas on the AT. "Well I met Guy, N7UN, for the first time on Friday morning. We drove to the Hamburg Reservoir Parking Lot and then hiked the 2.5 miles up to Pulpit Rock. I used my K1 with my VBWFPA. Guy used a vertical too. Guy worked 20m while I worked 40m. Thanks to all who called us. I must apologize. I was using my Palm PDA to log and I just can't get used to it. I will use a paper log and my AT Paddle only for all future trips. We hiked 5 miles Friday morning then drove to Cabela's for lunch. We then drove west to Rt.501 and started the next hike about 2:30pm. 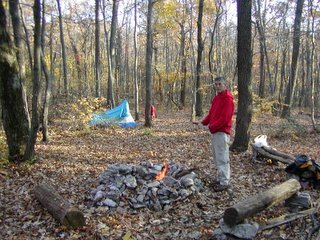 Guyand I hiked another 3.5 miles out to Round Head and set up camp there-it was great! Warm sunny weather with a big blue sky. We set up camp just as darkness fell on us. I then started a nice campfire and we just sat there gazing at the fire under a starlight sky. Guys, it doesn't get any better than that! On Saturday morning I made contact with a K8 in MI, but my palm froze up. It gave me some funny memory error that I couldn't clear? So I took the batteries out and reinstalled them. To mysurprise it cleared the error, but also cleared all my apps on the Palm too! I had no way to send cw as I forgot my AT Paddle when I changed packs! The lookout near the camp has a killer view to the west and all the trees look like they're on fire! We could see the entire mountain we hiked out to get to Round Head. We both had a great time, but my feet are feeling the 12 miles we hiked! 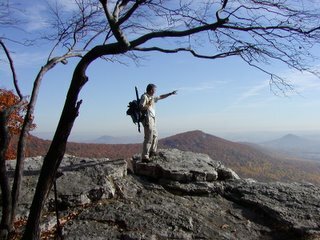 Guy is looking into a hike this year yet to the top of a 3K+ mountain in NJ or NY. I have decided to upgrade my K1 by putting 4-band board, backlight and tuner into my K1. Guy's K1 backlight was so cool! So that's the rest of the story! More to come later from the Nomad.....72, Ed, WA3WSJ"